Passing on a kidney stone is one of the most physically painful things a person can go through this side of childbirth. And a new study published this week in Mayo Clinic Proceedings suggests that they’re seemingly becoming more common. But by how much, and why, we’re still not really sure. Mayo Clinic doctors examined the meticulously kept and anonymous medical records of patients in Olmsted County, Minnesota over the span of three decades. From 1984 to 2012, there were slightly over 10,000 people who had been diagnosed with either a kidney or bladder stone (the difference being where the stone first formed). 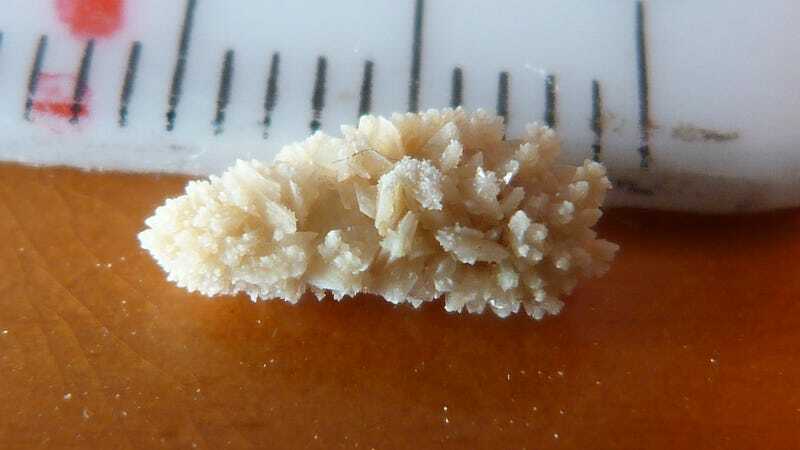 The researchers then randomly selected and reviewed the charts of over 7,000 cases, finding an unmistakable increase in kidney stone cases diagnosed annually. But there were changes over time in how frequent they became among different groups, as well the type of diagnoses given. “[T]he incidence of kidney stones increased dramatically in both adult men and women from 1984 to 2012, with the largest absolute increase occurring in younger women,” the authors wrote. Confirmed diagnoses among women (per every 100,000 person years) quadrupled between 1984 to 2012, while they doubled for men. Men overall were still a bit more likely to have confirmed, painful kidney stones. The incidence of bladder stones, meanwhile, remained low and relatively unchanged. Part of this rise likely has a lot to do with how doctors have changed how they monitor stones, the authors say. In 1984, less than 2 percent of people with painful symptoms caused by kidney stones had them confirmed via a CT scan; by 2012, that percentage had skyrocketed to 77 percent. The greater use of more accurate CT scans has led to doctors both finding smaller stones that are causing trouble and finding kidney stones in people with no symptoms by complete coincidence. At the same time, though, it’s pretty unlikely that the spotted increase is entirely due to better tests. Stones are a build-up of waste byproducts like salt that solidify in our urinary tract, and can be caused by lots of different factors, including unlucky genetics. But the authors note that stones mostly made of calcium (the primary type) have also become more common, and it’s known these stones can be helped along by a diet high in fat, sugar, and salt. That’s the same sort of diet that’s become increasingly popular over the last thirty years. The increase of type 2 diabetes and obesity might also be raising our chances of getting a stone. Race too probably played a role in the findings. Nearly 90 percent of kidney stone cases happened among white people, who are already known to be more likely to develop them. So the increase, if there truly is one, might not necessarily apply to other groups. Currently, it’s estimated that about one in every 10 Americans has or will experience at least one kidney or bladder stone during their lifetime. And while most cases eventually resolve on their own without dramatic treatments like surgery—though not without buckets of pain—doctors advise that the easiest way to move things along is to drink plenty of water. Or hell, just try going on roller coasters regularly. What Is Causing the Kidney Stone Epidemic?